Did you always think that acne ended with the awkward teen years but now, as an adult, you find yourself battling breakouts and blemishes? There are a number of reasons you could be breakout out. Let’s take a look and see if any of these sound like you. 1. You're stressed - Something in your life is causing you stress. Is it your job, your relationship, your family? Are you moving house or having to make a big decisions? Stress is one of the leading causes of adult acne and causes the worst reactions. So if you’re stressed make sure you get eight hours sleep- it will do wonders for your flair up. 2. You keep touching your face - Are you a face toucher? A lot of people do it without even thinking about it. It can be a nervous habit or something you do subconsciously, but what you are doing is adding unnecessary bacteria to your skin. If you are a face toucher make sure you wash your face every day with a gentle wash like Proactiv’s three step kit, but it’s also important to give your hands something else to touch. You could even try a fidget cube in your pocket or something along those lines. 3. You're experiencing hormone changes - You may be getting your period, or you’re perimenopausal, or you’re going through menopause- either way, your hormones have a lot to answer for. They can cause mood swings, weight gain and acne breakouts so if it’s severe make sure you see your GP so they can help balance your hormones. 4. A sudden change in temperature - Your skin can suffer if there it is exposed to sudden changes in temperature, so have you just returned from the tropics to the cold? Or you’ve spent some time skiing? It can take your skin a while to adjust and this can cause breakouts. 5. Your skin is too dry - Have you been spending a lot of time with the heat blasting? Or do you work all day in airconditioning? Both these things can dry your skin out and cause breakouts. If you are using heating, invest in a humidifier, or place bowls of water around your house, especially if you are sleeping with the heat on. If you are stuck with air conditioning make sure you moisturise regularly. 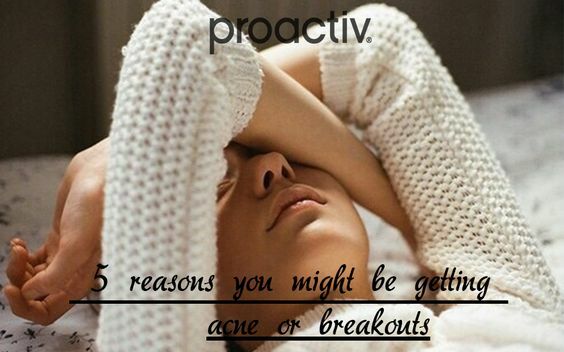 Hopefully these tips help you identify why you might be suffering from a breakout. Next week we are talking how to care for your winter skin!